One of the most good looking car mod for your GTA San Andreas Android is here. This car mod will replace the Feltzer car from GTA San Andreas to Audi R8 2014. The mod is awesome and car is great there is also custom handling for this car. You can also remove the car roof by going to transfender shop.The maker of this mod is "torry3233 & wai". 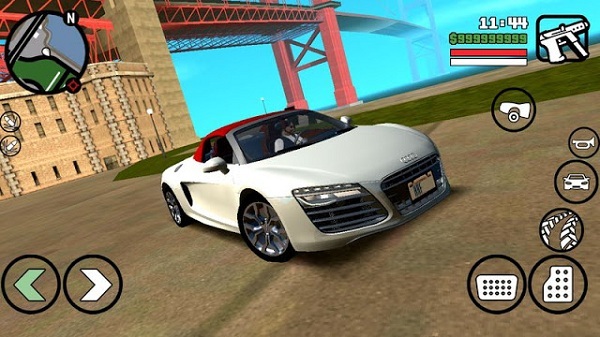 Salah satu mod mobil cantik untuk GTA San Andreas Android sekarang ada di sini. Pada mod mobil ini akan menggantikan mobil asli bernama Feltzer dari GTA San Andreas ke Audi R8 2014. Modnya cukup keren dan juga ada penanganan custom untuk mobil ini. Anda juga bisa melepas atap mobil dengan pergi ke toko transforer. Pembuat mod mobil ini adalah "torry3233 & wai". This mod will replace the "Feltzer" car with Audi R8. After installing this mod search for Feltzer car and you will see this car. You can also install this car mod using your Android Phone (No Need PC) to adding this mod. Mod ini akan menggantikan mobil "Feltzer" dengan Audi R8. Setelah memasang mod ini cari mobil Feltzer dalam game dan Anda akan melihat mobil ini. Anda juga bisa memasang mod mobil ini dengan menggunakan perangkat Android Phone (No Need PC) alias tanpa PC atau Komputer.